Teaching is a tough job, and getting harder every day. Our classrooms are full of needs that we don't always have the tools or resources to support the way we'd like. More and more of us are feeling exhausted, frustrated, defeated. 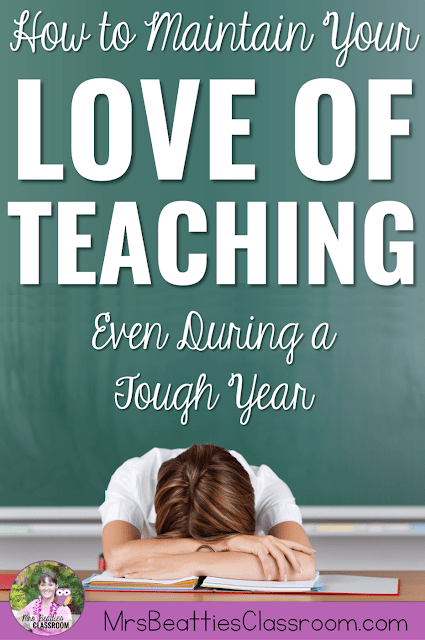 I asked, and my readers answered with their ideas about how to maintain your love of teaching during a tough year. This 20th year of my career has been a challenging one. The many needs in my classroom are exhausting, and I leave at the end of the day feeling frustrated that all my years of experience are failing me. 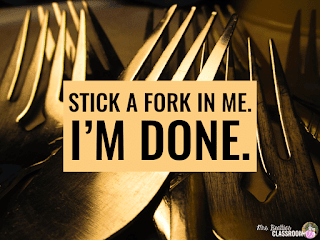 I know that I am a good teacher - managing behaviors and creating a caring classroom community have always been strengths, but nothing I've tried this year seems to work. That is hard for me to swallow. It makes me feel like a failure some days. If you haven't had a year like this yet, you're lucky. Not to be a downer, but it is coming. We all go through it. We all survive it and come out on the other side with our love of this amazing profession we've chosen intact - but only if we make taking care of ourselves a priority. So, how am I getting through it? The answer to that question is a lot of self-care. I have an amazing husband who I couldn't get through this year without. I try not to spend too much time in my classroom after the instructional day ends. I have an amazing registered massage therapist who I visit every couple of weeks. But enough about me. 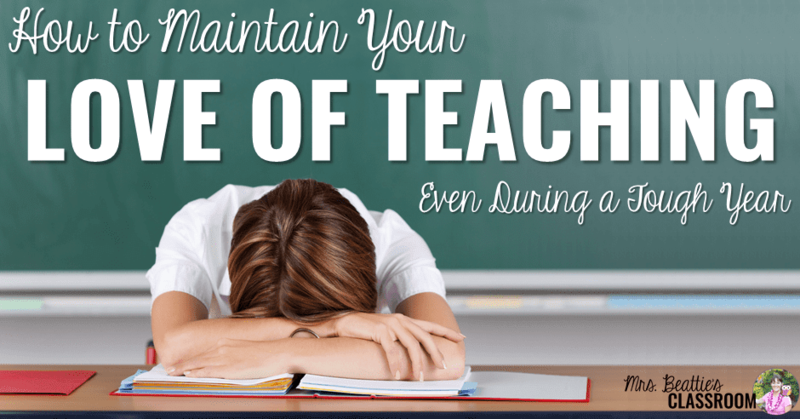 I asked my email subscribers how they maintain their love of teaching during a tough year and they had some fantastic advice to share. Get together with fellow teachers and talk about successes in our classrooms, NOT complaints! -Sandy T.
Thanks so much to everyone who contributed their ideas! I would love to have included them all, but this post would be FAR too long! Congrats to Ms. Brittany, who won a resource from my Teachers Pay Teachers store for her contribution! If you are new to Teachers Pay Teachers (my all-time favorite site for teaching resources! ), you can set up a free account here! No matter how much we love our job or how much time we invest in creating the best learning environment we can, teaching is difficult. Please remember to take care of yourself first. You won't be any good to your students or your family if you are stressed out, upset, or angry all of the time. Hopefully, you've found some inspiration here for how to maintain YOUR love of teaching during a tough year. Please don't go without first leaving your own words of wisdom or inspiration! Leave a comment below for other teachers who need it or me! Loved reading the submissions. I know that to help me and the kids we often listen to various types of usic throughout the day. We pick the genre depending on what we are working on. For example classical during reading, up beat music during brain breaks where we dance around the classroom. My class has started using music as a way to calm down,connect, or get the wiggles out. For example we use classical music during reading and writing, and more up beat music for a brain break where we dance around the room. It helps us to focus and re-focus on our day.